Thanks to everyone that came out to our estate sale last weekend! Despite most of the big stuff selling at half-price, the sale brought more than we expected. Robin and I literally received the key to the house 6 days before the sale and we had to conduct the sale last weekend because they closed on the house Tuesday. We hustled and got everything done with maybe 30 seconds to spare before we opened Friday morning. People asked us if this is our new gig and our answer is “no”, but we’ll probably conduct sales now and then. 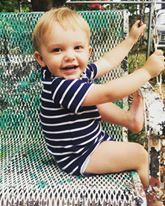 We could probably do it if Little Caleb was older. The one afternoon he was at the estate, he was constantly “rearranging” things and I had to stop him multiple times from running through the house with stemware. Little boys and pretty things just do not mix. LoL! On top of all that, an unknown person had a key to this house, which was super creepy. We didn’t realize this until the last day of the sale when we noticed ceiling fans were left on, the toilet seat was left up, and an expensive set of flatware was missing. I was at the house multiple times late at night by myself and never thought about an unknown person possibly having a key! Things like this make me appreciate our estate sale agents even more! We have another great selection of estate sales this weekend. Here are the ones I know about. Happy junkin’! We are privileged to represent the amazing estate of the renowned Dr. Bettye Caldwell. Beautiful original artwork. Oil paintings and water colors by local artists, Chinese artists and many others. Baker, Stickley and Ethan Allen furniture. Beautiful Game Table and chairs, drop front desk, sofa and love seat, poster beds, chests, dressers, collectables from around the world. Beautiful jewelry, china, Waterford, books, linens, ladies clothing including Chico and Pendleton brands, pocket knives and hunting knives, Stiffel Lamps, TVs, Christmas, Dept. 56 New England Village, rocking chair, lift chair (like new), BERNINA sewing machine and lots of sewing accessories, gardening, plants, patio furniture, packed garage, packed kitchen, washer, dryer, refrigerator, kitchen aid mixer, juicer and much more. Hope to see you there. Come for the sale and stay for the view. Sterling tea & coffee service with sterling tray, sterling spoons & goblets, costume jewelry, pocket knives, rosaries, a stamp collection, 3 bags of uncirculated pennies, beautiful framed art throughout, candle sconces, love seat, sofas, multiple pairs of arm chairs, recliner, coffee & side tables, designer lamps, oriental rugs, silk florals, nice vases, silver plated serving pieces, fine china as well as every day dishes; lots & lots & lots of kitchen & barware – including, crystal & glass stemware, pink depression glass, Pyrex baking dishes, cast-iron & enameled cast-iron, small appliances, cooking utensils, flatware, cookbooks, side-by-side fridge, regular fridge, upright freezer, washer & dryer, round glass-top table, dining chairs; a beautiful wooden desk, entertainment armoire, an office armoire with drop-down desk, chest of drawers, queen-sized canopy bed, memory foam mattress, men’s & women’s clothing, shoes & accessories – many vintage pieces, handbags, ladies’ fur wrap & several hats (& department store hat boxes), a pair of barrel-back chairs with rattan upholstery, toiletries & beauty supplies, antique wall case clock with Coca-Cola face, huge selection of books, beautiful drop-leaf round table, wedding gown w/ vail, upright piano by Hallet, Davis & Co. – New York, painted chest, art pottery, indoor water feature, filing cabinets, office supplies, LPs, 45s, cassette tapes, electric typewriter, small desk, Large collection of political memorabilia – great variety, nice patio furniture, potted plants, concrete fountain, gas & charcoal grills, the garage is simply overflowing with garage shelving, yard tools, exercise bike, Craftsman mower, framed posters, chalkware, antique cash register, Hog stuff, holiday decor, a live trap, kid’s pin-ball machine, garden cart, an antique wooden bench, and SO MUCH MORE!! 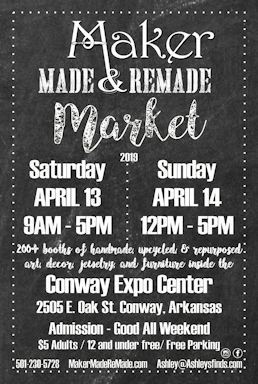 We offer a house full of treasures this weekend in Conway. Furnishings include a beautiful framed sofa, side chairs and tables, a huge mirrored hutch with shelving, covered wooden back bench, 2 stacking lawyers bookcases, a sweet desk, rockers, recliners, wicker chair, bamboo chair/table set, drop leaf oak table, pillow top full mattress set, upholstered headboard with matching linens and pillows, round kitchen table, sewing cabinet, end tables and lamps. We even have a pew from the old First Baptist Church! We have a Maxfield Parrish print, Aaron Bohrod print and other art pieces including a few originals on canvas from the owner. There is a sewing machine, lots of fabric, yarn, blankets and throws, recumbent bike, medical supplies. Vintage holiday items, full kitchen, garden items, BOOKS, old typewriters, crystal and china, and other great finds! come take advantage of our misfortune! living room furniture, entire dining room set, bookshelves, lots of books, rugs, futon, bedroom set, lamps, musical instruments, 1950s sewing machine, artwork, antique dining buffet, marble top end tables, coffee tables, outdoor furniture and patio furniture, drop leaf table on wheels, lawn mowers(2) old typewriters(2)plants and planters, gardening décor, outdoor statues, gas grill, wicker trunk, bedding.Duncan Fyfe entire antique bedroom set, everything for the kitchen. Original art, fine and costume jewelry, women’s designer clothing. We will have lots of household and vintage items, including Light fixtures, vintage stereo, golf clubs and much more!! 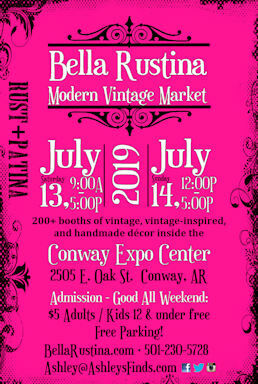 Open-air market for vintage (20+ years old), antique (50+ years old), upcycled/recycled items and handmade/original art. 250 Booths filled with vintage, repurposed, salvage, boutique, rusty & chippy junk. 2 days of FUN, live music & some of the best food trucks around!! 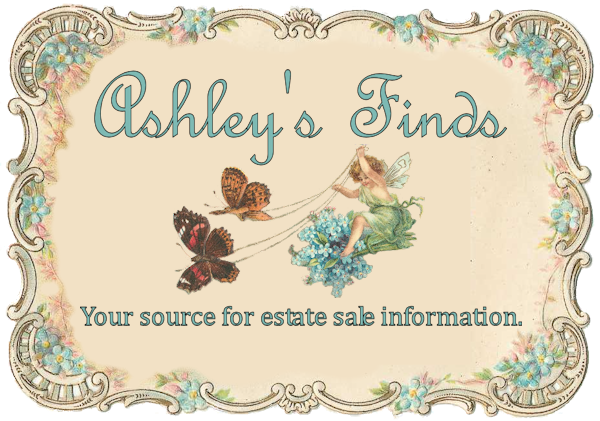 PARTIAL LISTING: FURNITURE: Dressers; Chests; Tables; Dinette; Freezer; Chairs; Entertainment Stand; Air Conditioners and More!!! Coca-Cola Collection; Mowers; NEW PRODUCTS: Hardware and Tools; Bug Zappers; Roll Roofing; Fishing Items; Weed and Bug Sprays; New Tires; Wood Carved Trim; Novelty, Discount Store and Giftware Items; OLD COLLECTIBLES and ANTIQUES Plus Lots More!!! This auction will be consignments from Central Arkansas and have Antique furniture – Oak Wishbone wash stand, Mahogany music cabinets, Globe-Wernicke stack barrister’s book case w/ horizontal sliding glass doors,English side board w/ mirrors, Oak claw foot round kitchen table w/ hidden center leg, antique trunk w/ Oak slats, Oak single stack book case w/ top, antique Oak cash register stand, Antique walnut sofa table w/ hidden leaf, Heywood-Wakefield Champagne 4 drawer chest, Awesome 3 pc. double book case entertainment center, 15 place gun cabinet w/ locking drawers, beautiful Fenton bells & vases, Orrefors stemware, Baccarat pelican & Angel crystal figures, vintage ruby/milk glass cut glass ceiling fixture, Oriental lamps, Oriental style black lacquer coffee table, Oriental 4 panel room divider, King size decorator sleigh bed frame, Modern design 4 panel room divider w/ mirrored circles, Queen size bed w/ beauty rest mattress, assorted tables & book shelves, 5 antique Oak pattern back chairs, 4 Oak antique swivel office chairs, 3 Oak dining chairs w/ “V” back – no seats, cane bottom chair, leopard print arm chair, set of 4 dining chairs w/ upholstered seats, Duncan Phyfe triple leg dining table w/ 3 leaves, Victory & other vintage wooden puzzles, Minox sub=miniature camera & light meter, Spode Christmas items, vintage linens, decorator vases & mirrors, framed prints & Artist proofs, Jazzy electric chair, recumbent exerciser, curved concrete garden bench, and more!